I'm trying to use dumbbells more at the gym instead of only using machines. 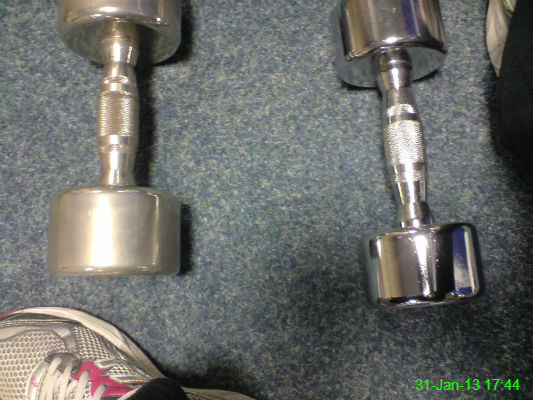 Today I used the 9kg weight on the left for overhead triceps extensions, shrugs and bent over rows and the 6kg weight on the right for biceps concentration curls. After work I went for one of my thrilling trips to Wilkinson to buy some household supplies. 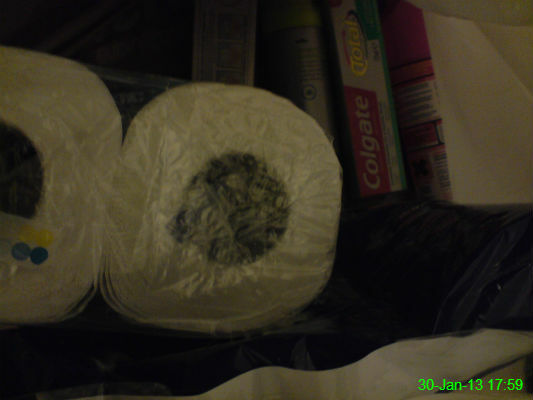 The results are in this bag: toilet roll, toothpaste, kitchen roll, shaving gel and bleach. Please, try and contain your excitement. The main thing I'm proud of is that I still managed to make it onto the first bus home and arrived before 6pm, which doesn't happen very often! Sorry, another food one! My tea of chicken, potatoes and veggies was not particularly inspiring, so I added hot chilli powder to my gravy granules to spice it all up a little. The result was surprisingly decent - must be all those TV cookery shows I watch. 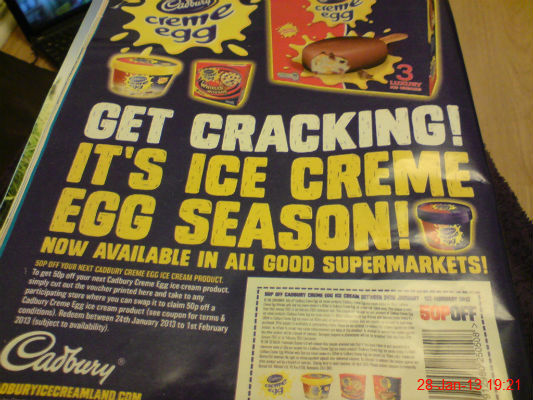 My magazine contains a voucher for variations of Creme Egg ice cream. I'm tempted! Mam, Auntie Sue and Gran, all looking a little bit younger than when I saw them today. 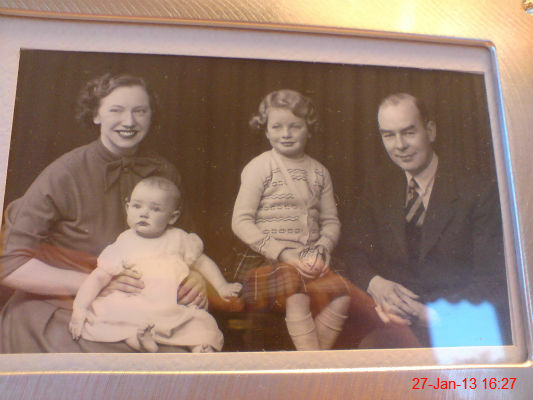 Unfortunately I never got to meet Grandad Moffat, but since the rest of them are lovely I'll assume he was too! Sister. Cider. Pizza. Button Moon on the telly. Perfection? Aye. 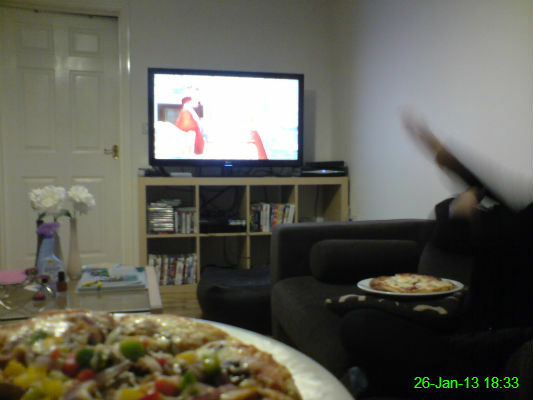 Except for Ali's arm, which appears to be doing some sort of Hitler salute. 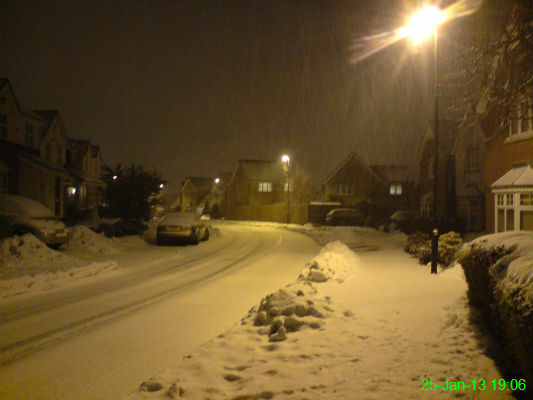 I was trying to hurry home to get out of the snow.. but our street did look lovely. 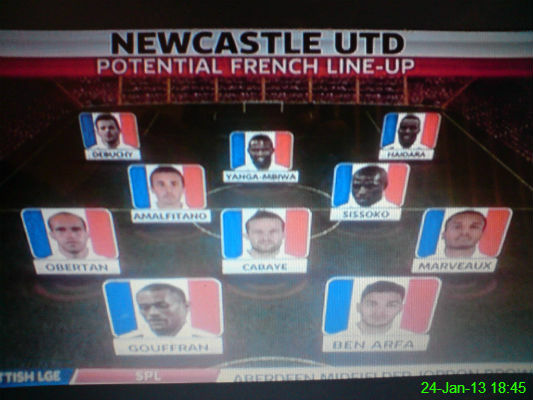 So far in the January transfer window Newcastle have signed Debuchy, Yanga-Mbiwa, Haïdara and Gouffran, with Sissoko hopefully to follow soon. Add these to the players we already have and we can field an outfield team made entirely of French players. It almost has me wishing I'd taken French instead of German at GCSE, until I remember the French exchange student who tried to steal my belongings and stank of body odour. I started reading this a few days ago. It's like a book equivalent of ADHD because it jumps around all over the place, but I suppose that isn't any great surprise, given the author. It passes the time, anyway! 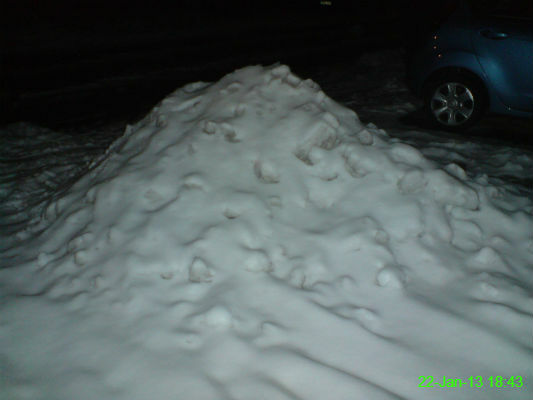 Everyone in the street is shovelling their drives, which means the pavements are covered in these snow mounds. I find it quite inconsiderate towards those of us who walk everywhere! This one wasn't blocking the path, though it was covering half of the communal parking area. I reserve the right to take the occasional extremely boring photograph. 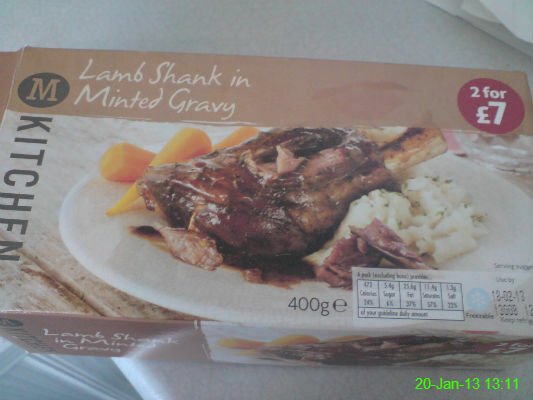 On the menu today is one of my favourite meals: lamb shank. 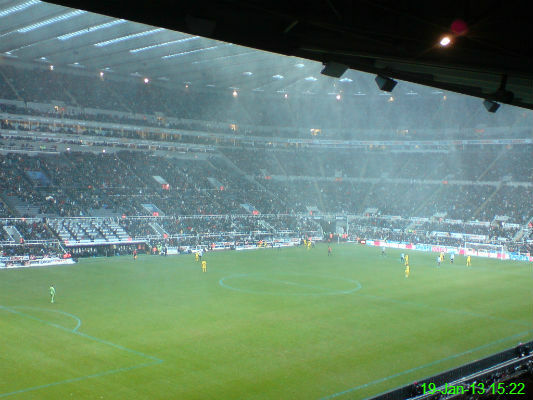 Yet another awful home match which was only made marginally more interesting by blue lines and snowfall. 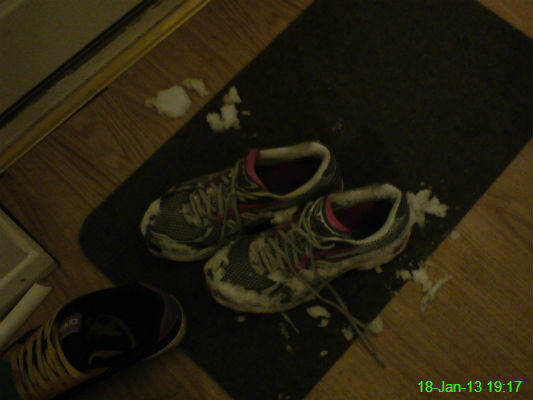 I'm grateful for the air holes in my trainers when I'm exercising, but they don't seem quite as clever when I'm walking home through several inches of snow. 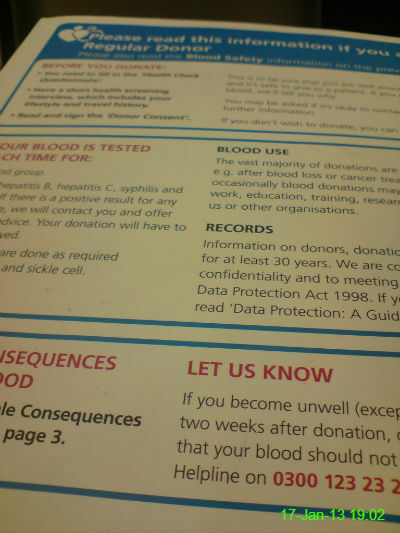 I went for my 8th blood donation so had to read through the usual literature beforehand. I hope whoever receives my blood lives a long and happy life because it was so icy I nearly died several times on the way there and back! 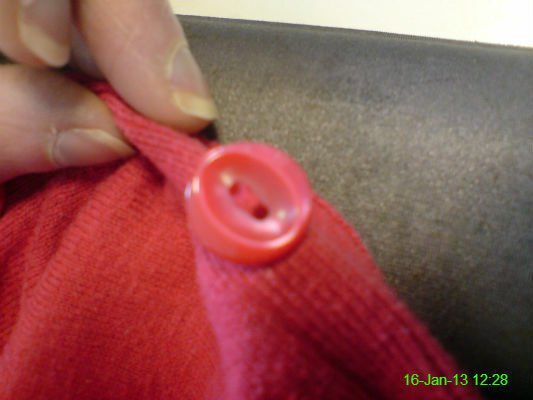 Not for detonation or to press when someone is panicking.. just part of my cardigan. 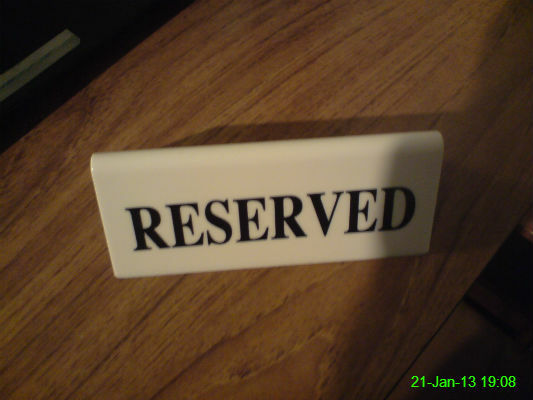 At work I often have to experience various presentations, seminars and training courses. 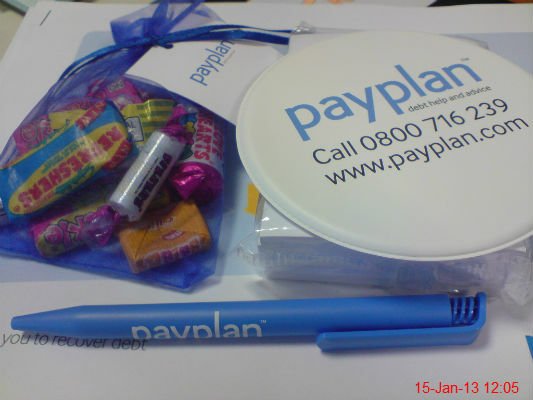 These are sometimes pretty dull, but today's visit from Payplan was both interesting and informative and they even brought plenty goody bags to be passed round. 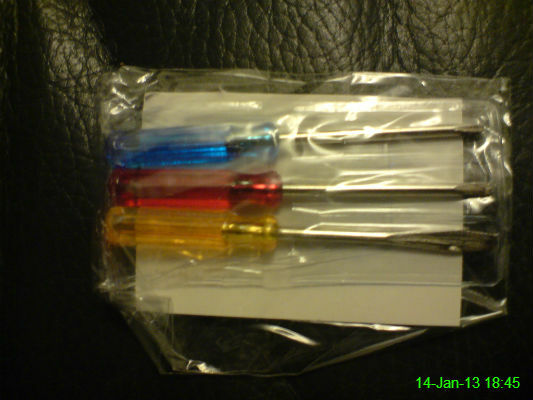 Tiny screwdrivers. Out of a Christmas cracker. I have no further comment. 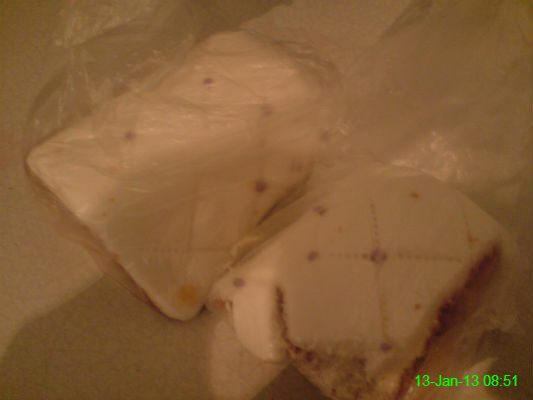 Some of my Gran's birthday cake. It's a valid breakfast.. right? 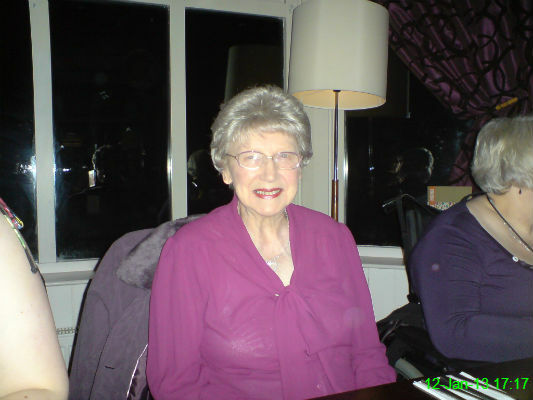 My Gran at a meal to celebrate her upcoming 90th birthday. Legend! 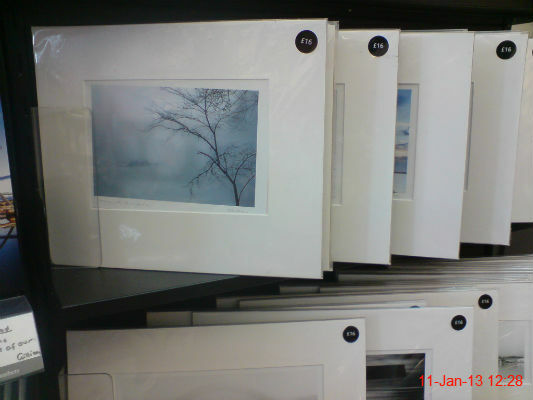 I was looking for something in Waterstones and ended up casting my eye over some nearby artwork. I'd pass comment, but I've never been much of an art critic. 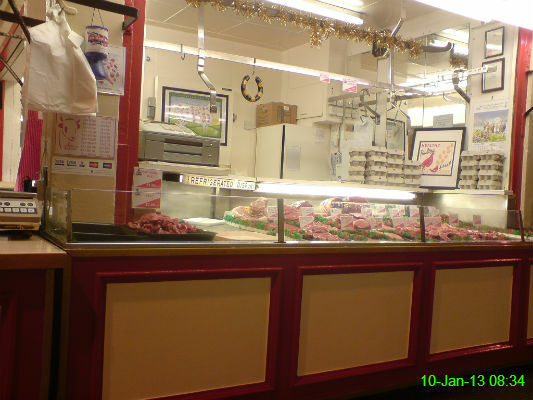 The Weigh House opened a few minutes late this morning so I had a browse at the meat at this butchers in the market. Another one of my Christmas presents - these lovely warm bed socks were from Nasser & Sophie. 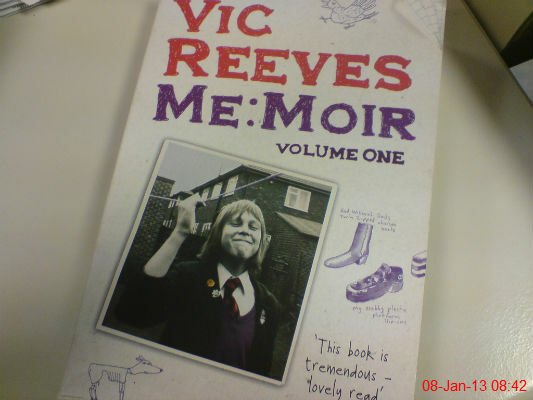 I sort of get the impression that he only wrote this because he had a witty title based on his real name, James Moir. It's still a decent read though. This is my good deed for the day. 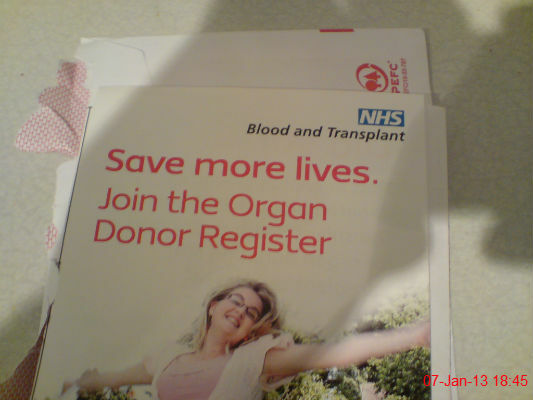 I would like to encourage everybody to sign up to be an organ donor. 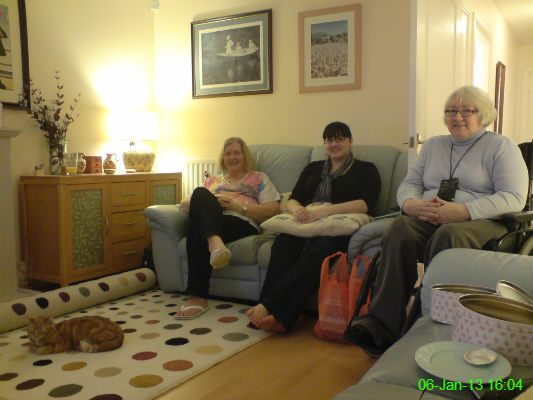 You don't need 'em when you're gone..
Jaffa the cat, Auntie Sue, Ali and Mam in the lovely bungalow Sue moved into just before Christmas. 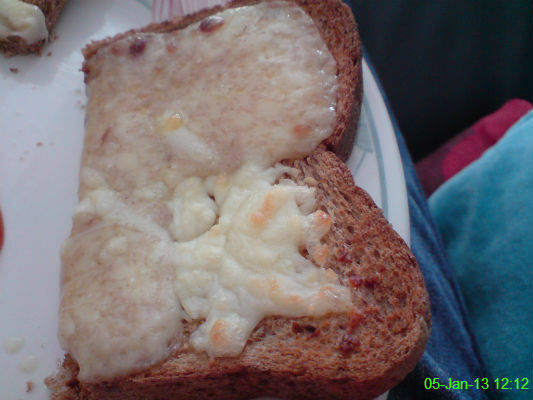 Cheese on toast has to be my biggest weakness. This was made predominantly with "plum chutney cheddar" with a little bit of mozzarella thrown on to fill a gap where I ran out, hence the slightly different colour cheese and almost naked corner where my distribution wasn't up to scratch. It was still amazing. Buying this new toothbrush is about the most exciting thing I've done this week. 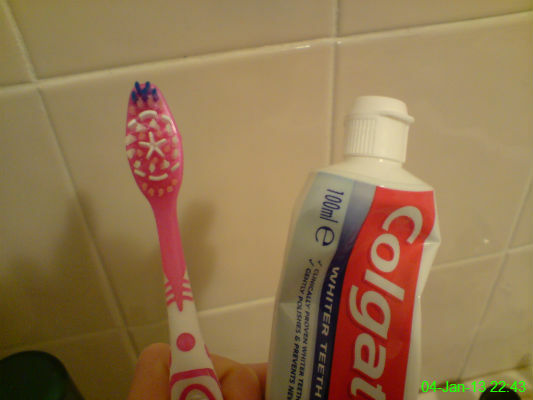 It has a star-shaped bit in the middle for whitening teeth and it certainly makes them feel squeaky clean. 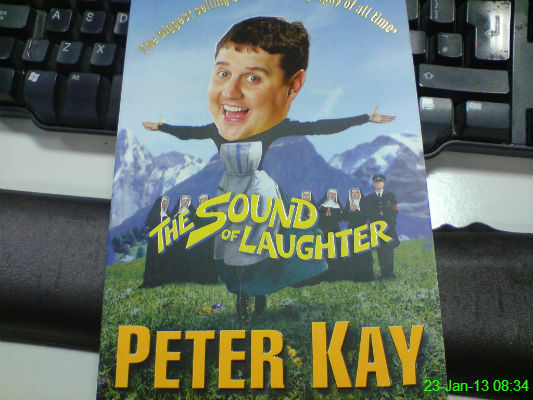 I saw something had come through the letterbox and was hoping that it wasn't either a takeaway menu or a charity bag, as neither are much use to me in January. 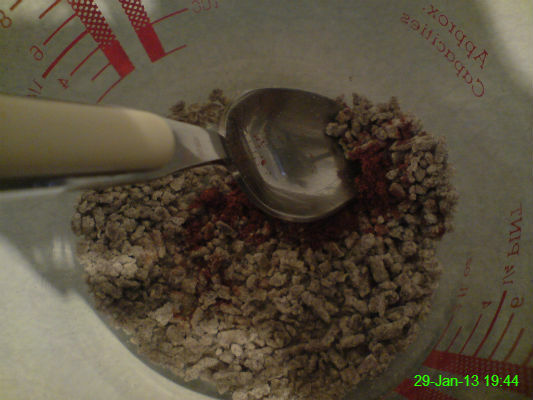 It was actually a leaflet for Slimming World which contained an example of meals for a day. I can't help but think a bacon and egg sandwich followed by a bowl of fruit seems a little excessive for breakfast.. but hey, it's not my diet. 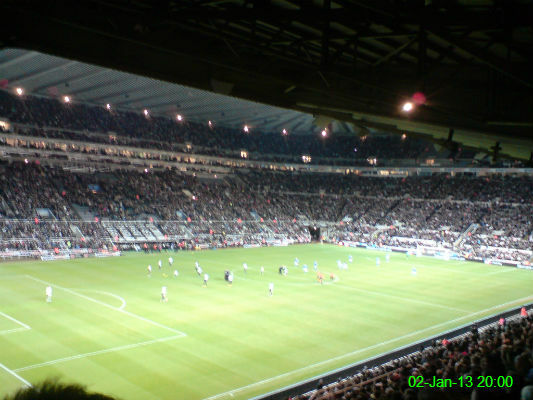 Going to the match was precisely the last thing I felt like doing after my first day back at work, and the scoreline came as no great surprise. After getting back from Mick's party we have one last drink before turning in for the night. 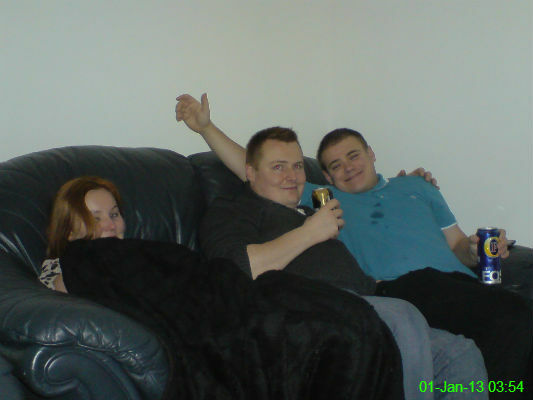 Nicole has stolen my blanket, James looks a bit creepy and Michael has managed to spill lager on his top. Gotta love 'em, yeah?